This book, a milestone in American music scholarship, is the first to take a close look at an important and little-studied component of African American music, one that has roots in Europe, but was adapted by African American congregations and went on to have a profound influence on music of all kinds—from gospel to soul to jazz. “Lining out,” also called Dr. Watts hymn singing, refers to hymns sung to a limited selection of familiar tunes, intoned a line at a time by a leader and taken up in turn by the congregation. From its origins in seventeenth-century England to the current practice of lining out among some Baptist congregations in the American South today, William Dargan’s study illuminates a unique American music genre in a richly textured narrative that stretches from Isaac Watts to Aretha Franklin and Ornette Coleman. Lining Out the Word traces the history of lining out from the time of slavery, when African American slaves adapted the practice for their own uses, blending it with other music, such as work songs. 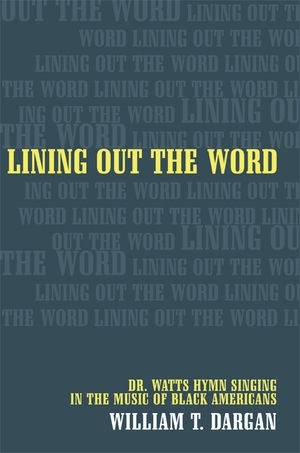 Dargan explores the role of lining out in worship and pursues the cultural implications of this practice far beyond the limits of the church, showing how African Americans wove African and European elements together to produce a powerful and unique cultural idiom. Drawing from an extraordinary range of sources—including his own fieldwork and oral sources—Dargan offers a compelling new perspective on the emergence of African American music in the United States. William T. Dargan is Professor of Music at Saint Augustine’s College.